Reverend Thomas Robbins may have thought he had seen it all. After all, a decade earlier he, as a Congregational missionary, traveled to the frontier lands of New Connecticut in northeastern Ohio, where he endured torrential summer downpours, deep winter freezes, and a variety of temperamental fevers and chills. That experience—a long three years—broke his health, and he returned to Connecticut to recuperate. 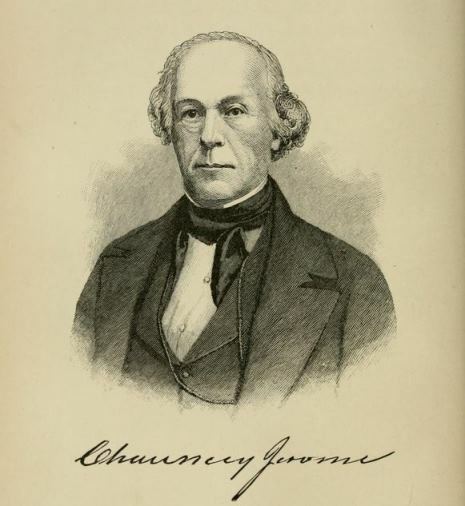 Now, in 1816, he lived in East (now South) Windsor, where he enjoyed a comfortable house, an enviable collection of books (which became the core of the Connecticut Historical Society), and the busy schedule of a minister. As he had done since 1796, Robbins recorded in his diary the weather and, if not the weather, his activities that revealed the weather. In the first days of March 1816, Robbins planted peas. A week later he noted that the day was “quite warm.” Three days later, on March 12, he noted that it was “cold and wet.” It snowed, and two days later the ground was “considerably frozen.” He would not attempt to replant peas until the end of April. At the height of harvest season, on September 5, Robbins confided to his diary, “I presume no person living has known so poor a crop of corn in New England, at this season, as now.” By the end of the month frost had killed much of the corn crop. 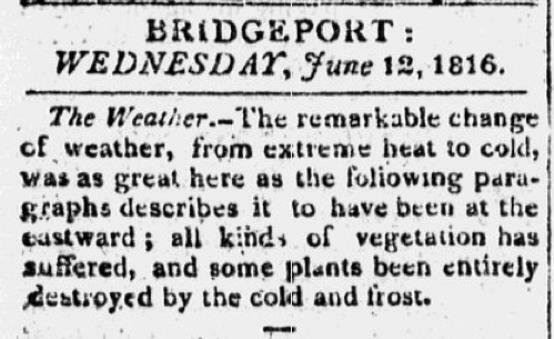 The low temperatures of the summer months of 1816 spelled disaster for Connecticuters. Farmers had little wheat and corn to take to market. Animals had little to eat. Prices for staples such as flour and meat rose for consumers and the drought caused forest fires, filling the skies with smoke. At the time, individuals pointed to the increasing size and numbers of sunspots (visible to the naked eye), an eclipse of the moon occurring on June 9, and the vast clear-cutting of forests and cultivation of the soil as reasons. The sunspots, many believed, reduced the sun’s rays and cooled the atmosphere. The moon’s eclipse interfered with the moon’s gravitation pull, resulting in changed wind patterns. (The impact of high winds on plants being clearly visible.) Others theorized the diminishment of forests and the constant turning of topsoil allowed the earth’s heat to escape into the atmosphere and caused the cooler weather. Today, scientists point to volcanic eruptions as the reason for “the year without a summer.” Four volcanoes erupted in these years, but the fifth, Tambora, on Sumbawa, Indonesia, which erupted between April 7 and April 12, 1815, was the largest. Over 10,000 persons died as a result. The sound of the eruption was heard one thousand miles away. The ashes and cinders created darkness for three days for hundreds of miles around the volcano, and the winds carried these ashes and cinders around the earth. Scientists also confirm that, during increased sunspot activity, the earth’s temperature is reduced. The combination of increased sunspot activity, heightened volcanic activity, and cooler water temperatures (ice on the Great Lakes and in the Atlantic Ocean) in these years combined to create an agricultural disaster, especially in New England and northern Europe. The winter chills from 1812 to 1815, 1816’s ruinous harvest, and the end of the War of 1812 combined to cause “Ohio fever” among the hungry and financially straitened in New England. As Connecticut author and publisher Samuel Griswold Goodrich recalled, “Ohio—with its rich soil, its mild climate, its inviting prairies—was opened fully upon the alarmed and anxious vision. As was natural under the circumstances, a sort of stampede took place from cold, desolate, worn-out New England, to this land of promise.” From his office in Hartford he watched wagons and ox-carts and hand-carts piled high with household goods pass through the streets. Although Connecticut was not as hard-hit as the states of northern New England, like its neighboring states, it experienced slower population growth as its citizens headed westward. “Catalog Record of the Diary of Thomas Robbins, D. D., 1796-1854.” Connecticut Historical Society Library Catalog, 2017. Link. Goodrich, Samuel G. “Letter XXXIII.” In Recollections of a Lifetime: Or Men and Things I Have Seen ; in a Series of Familiar Letters to a Friend ; Historical, Biographical, Anecdotical, and Descriptive, Vol. 2. New York: Miller, Orton, and Mulligan, 1856. Link. Perley, Sidney. “The Cold Summer of 1816.” In Historic Storms of New England. Its Gales, Hurricanes, Tornadoes, Showers with Thunder and Lightning, Great Snow Storms, Rains, Freshets, Floods, Droughts, Cold Winters, Hot Summers, Avalanches, Earthquakes, Dark Days, Comets, Aurora-Borealis, Phenomena in the Heavens, Wrecks Along the Coast, with Incidents and Anecdotes, Amusing and Pathetic. Salem, MA: The Salem Press Publishing and Printing Co., 1891. Link. Klingaman, William K., and Nicholas P. Klingaman. The Year Without Summer: 1816 and the Volcano That Darkened the World and Changed History. New York, NY: St. Martin’s Press, 2013. Hoyt, Joseph B. “The Cold Summer of 1816.” Annals of the Association of American Geographers 48, no. 2 (June 1958): 118–131. Skeen, C. Edward. “The Year Without a Summer’: A Historical View.” Journal of the Early Republic 1, no. 1 (Spring 1981): 51–67.